Analysis: Bernie Sanders, Kamala Harris, Beto O'Rourke and Pete Buttigieg post strong numbers, but the rest of the field is holding back. 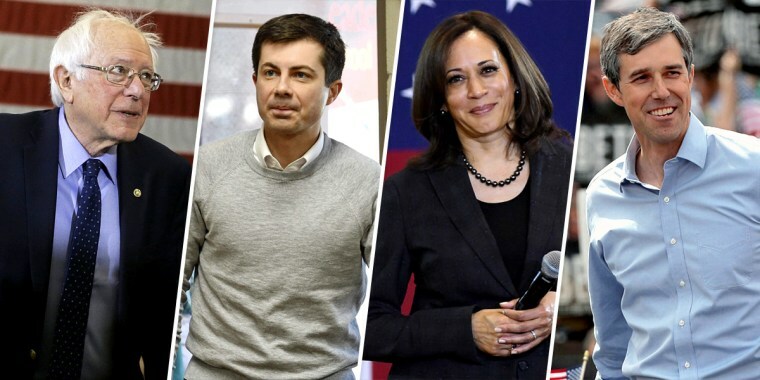 WASHINGTON — It's accounting time for the 2020 Democratic presidential hopefuls. And while that's good news for those rolling in cash, it will surely be the first highly public sign that others are flagging. Several of the top-tier contenders have announced their first-quarter fundraising totals for the period ending March 31. Sen. Bernie Sanders of Vermont paced the field with $18.2 million, followed by Sen. Kamala Harris of California at $12 million and former Rep. Beto O'Rourke of Texas at $9.4 million. Pete Buttigieg, the mayor of South Bend, Indiana, surprised many Democrats by pulling in $7 million, despite being a relative unknown at the start of his campaign. While those hauls pale in comparison to the $46 million Hillary Clinton banked in her first quarter on the trail in 2015 — which was actually the second quarter of that year — and even the roughly $25 million apiece she and Barack Obama registered in 2007, Democratic donors and strategists said Wednesday they've generally been impressed with this year's early returns. That's both because of the intense competition for cash and the focus campaigns have put into building small-dollar donor bases that can be hit up for more money later in the campaign. That is, a smaller haul that can be built on may be more valuable than stocking a treasury now with one-time checks written for the maximum legal amount. "In a field with north of 10 candidates that were actually fundraising, Bernie’s number is nothing short of extraordinary," said Robert Wolf, a key early backer of Obama's first campaign who has cut checks to O'Rourke, Harris, Buttigieg, New York Sen. Kirsten Gillibrand and New Jersey Sen. Cory Booker already this year. "We have a lot of friends running," Wolf said in a telephone interview with NBC News. "There’s a lot of new and exciting candidates running and we want them to get to the debate stage." Former Vice President Joe Biden, who is leading in national polls of Democrats, has not yet entered the race. Robert Zimmerman, another major donor and Democratic strategist, said that he gave his first-ever small contribution — to help ensure Buttigieg could meet party rules for getting on the stage at the NBC-hosted first Democratic debate in June — and "it felt pretty good" to dispense with the pig-in-a-blanket $2,800 fundraising receptions he's accustomed to attending. Neither he nor Wolf have endorsed a candidate in the race, and many top Democratic donors are either holding back or have been shunned by candidates trying to prove they aren't beholden to the rich and powerful. All of the leading Democratic candidates have pledged not to take money from corporate political action committees — which actually represent a tiny slice of giving in presidential campaigns — and many have vowed not take checks from lobbyists, fossil fuel industry employees or other sources. "What’s really important is the power of the small-dollar donor in this process," Zimmerman said. "When the first barista in Williamsburg is chosen for an ambassadorship, then I’ll know the revolution is complete." Each candidate has his or her own strategy, with Sanders showing again — as he did in his 2016 primary fight against Clinton — that he is the master of the small-donor game. His money came in the form of 900,000 individual contributions from a total of 525,000 donors, according to his campaign, and only one-tenth of 1 percent of his givers put in the maximum of $2,800 for the primary. Democratic strategists say Harris has the best hybrid operation. "Harris has the ability to raise low-dollar funds and major-donor funds," said Patti Solis Doyle, who served as the campaign manager for Clinton in 2008. "She seems to have tapped into a lot of the old Hillary donors. So I think it’s important to do both. But she strikes me as one of the few candidates who has the ability to raise money from major donors and low-dollar donors, and that’s an asset." O'Rourke launched his campaign just 18 days before the deadline and wowed the party establishment by raking in $6.1 million on his first day as a candidate. He later reported raising $1 million on the final day of the quarter, and his campaign notes that he raised more money per day than any other candidate. Interestingly, O'Rourke reported having the same number of contributions as Harris: 218,000. He raised $552,000 per day, while Sanders checked in at $444,000, Harris was at $171,000 and Buttigieg was at $103,000, according to an NBC News analysis of the data released by the campaigns. President Donald Trump, who has not yet reported his first-quarter totals for 2019, raised $67.5 million for his re-election campaign last year, a figure that does not include money collected by outside groups dedicated to assisting his campaign. Most of the Democratic field has yet to announce first-quarter fundraising numbers, including Booker, Gillibrand, Sens. Elizabeth Warren of Massachusetts and Amy Klobuchar of Minnesota, and former HUD Secretary Julián Castro. After Buttigieg, Harris and Sanders had revealed their totals, Zimmerman said, "you know who the three are who are proudest of their numbers." O'Rourke certainly has the money he needs to build out his operation for a longer haul, but some of the less-funded candidates will have trouble mounting serious bids if they don't pick up their contributions quickly. And a bad fundraising report can make that task much harder. Wolf said he's looking at four basic factors as he assesses the candidates: name recognition, the ability to raise money, their capacity to succeed in one of the first four states to vote and their chances of performing well on Super Tuesday — the day next March when the largest number of delegates to the Democratic convention are in play in a series of state primaries. "For me, that cuts the field in half right now," he said.